Do you like the idea of Scrapbooking, but you don't have the time or the know how? Watch this quick video to see how quick and easy scrapbooking can be. Save your precious memories without all the fuss. As an added bonus, this Scrapbook can be made for less than $20 and it's easy enough to put together in a weekend. Beautiful Packaging in 3 Simple Steps. These were one of the Make-n-Takes for Stampin' Up! Convention 2013. And it may be the simplest, prettiest and most useful, but I'll let you decide. Watch for other Convention Projects next week. Give them to teachers. Use them for Autumn Wedding favors. Decorate your Holiday Table. They're so quick and easy to make. You'll want to have some on hand for quick gift packaging. Stamp the Magnificent Maple stamp using Pumpkin Pie ink onto Mini Muslin Bag. Notice how the leaf design pulls out the Muslin. So Beautiful! Stamp "Truly Grateful" from the Truly Grateful stamp Set using Baked Brown Sugar Ink. Tie on a length of Crushed Curry Chevron Ribbon. You're Done! 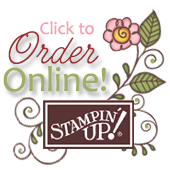 What's Shakin' at Stampin' Up!? Celebrate the change of seasons with some of our favorite autumn-themed stamp images from the past 25 years! A new, holiday-themed collection of single stamps is now available! The holidays will be here before you know it, and these holiday-themed single stamps may be just what the budget-conscious stamper needs. If you love an element of surprise and crafting, you'll love Paper Pumpkin. Each month a new Paper Pumpkin Kit arrives at your door. It's a complete kit. That means that there is no running to the store. Just open it up and get started. and Choose a Free Project Kit too! Thanks for choosing me as your demonstrator!